I’ve met three famous people in my life. Or, maybe not met – at least not exactly. We were not introduced in the way you might meet another person, with hand shakes and “Pleased to meet you” and all that. No, these were more like encounters. Like what you might do at a zoo with the animals. You pay a little extra and next thing you know you’re in the enclosure mixing it up with the kangaroos, or the giraffes. And by ‘mixing it up’ I mean walking a well-defined path while the animals come to you, if you’re lucky. There were three of them: David Sedaris, Michael Moore, and Herschel Gordon Lewis. I’ve been interacted at on another occasion by a straight up legend. That time Allen Ginsberg spoke to me, completely unprompted as he exited a book signing. He hadn’t signed anything for me, because I never made it farther than halfway up the stairs. Still, he came down by the people still in line – I guess it was the only way out – and just as he went by he apologized. To me. Alone. Or seemed to apologize to me alone. Anyway, he said he was sorry, but he had to be somewhere else, and that was it. So he apologized. 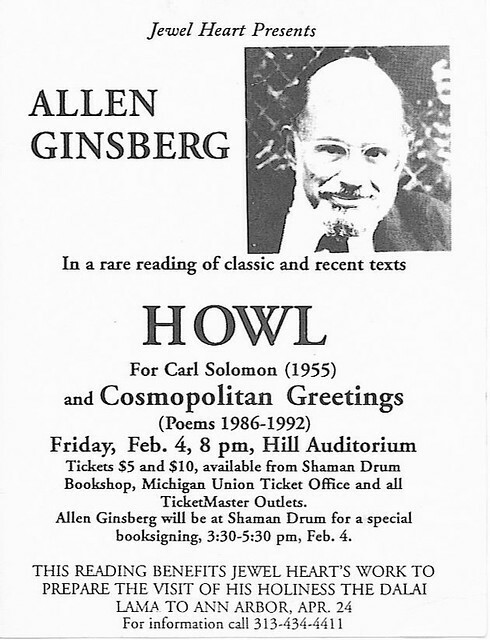 Not that Allen Ginsberg needed to apologize for anything, which is a perk of being legendary. But while I mean to say I’ve met three famous people, the Ginsberg story almost counts as a fourth, and even if it is a fourth, there really is a fifth, depending on your definition of fame. That fifth time was with former NHL defenseman, Harold Snepsts. In some circles he’s probably more famous than I let on, and maybe the most famous of the bunch. After all, he played 18 years in the NHL for 4 different teams – including my Detroit Red Wings – which means he played in front of a whole lot of fans over a whole lot of years. But, because he was a stay-at-home defenseman and never scored more than 8 goals a year in any of his professional seasons, he was never going to be known like Wayne Gretzky. He was never going to be the one guy from the sport that people who know nothing about it can name. Like Lebron James. Or Pele. Or Wayne Gretzky. But if I’m unsure about the extent of his fame, it’s because when I met him he seemed to be that way as well. Honestly, he was as genuinely surprised to be recognized by me as I was to recognize him, even if his sort-of unique look – male pattern baldness and bushy moustache – stood him out from the usual crowd. So if he’s unsure of his fame, then I can be, too. Of those meetings, just the one – Harold Snepsts – was uncurated. David Sedaris happened at a semi-impromptu signing for his most recent book, Calypso, at an indie bookstore near my house. Sure, the signing was announced no more a day before it happened, and he literally had just a half-hour to spare for it as he drove through on his way from Ann Arbor to Grand Rapids. But, because he would only sign something if you bought it in the store that day, it was perhaps the most curated of the bunch. So commerce brought us face-to-face, but it was still a pleasant meeting. My impression of David Sedaris? Charming, of course, though he seemed a little heavier in person than I thought he would be – only just – and was shorter than I imagined. But, like I said, he was charming and had an especially-wonderful rapport with the children, chatting them up and giving them all plastic bugs. The he almost seemed more interested in the children than the rest of us is almost expected. On the one hand, the children have no agendas, or thought to gush over him, to those interactions are pure. On the other hand, if a writer’s long-term earning power depends on being able to span generations, then you might occasionally find them more interested in courting the next fans than catering to the current. And even if this was not a full meet and greet, or a Q&A, he at least passed nice words with the rest of us, seemed genuinely interested, and did not roll his eyes and hurriedly dismiss the cranks. That said, it’s easy to be kind to people holding freshly purchased copies of your book and telling you how great you are. Even the Grinch would be gracious under those circumstances. Probably. Though, I wonder how Sedaris would’ve reacted if I tried to get him to sign a copy of his sister’s book, which was for sale maybe fifteen feet from where he sat. If I’m honest, he’d probably react well – he doesn’t seem that sort of diva. But because I didn’t ask, I’ll never know for certain. The Michael Moore meet was on campus at Michigan State University, when I was in law school. This was not long after he won the Oscar for Bowling for Columbine, which gave him no small amount of pleasure, and a story he could tell. But, this was also the height of the George W. Bush era and so Moore gave a rambling, only marginally-amusing protest speech that hit most of his favorite talking points but which also seemed like the first draft of something he probably should’ve tried a second or third draft on. Either way, he thought Wesley Clark deserved our support in the 2004 Democratic primaries, so he’s not exactly prescient. Afterwards, Moore set up a table and chair in the back of the auditorium and signed anything and everything put in front of him, which probably amounted to a couple thousand books, placards, scraps of paper, and anything else people could get their hands on. He might’ve signed pocket lint, if it were big enough to hold a pen to. I can’t say he treated everybody in line ahead of me well, or was friendly and engaging with them, but by the time I got to him he looked exhausted and spent and ready to go home. If he did more than grunt at me, I’d be shocked. To be fair, the event was free, and there were no strings attached to him signing anything – no purchase required – so he was literally doing this just to do it. Under those circumstances, it he was underwhelming or occasionally dismissive, that is the price of freedom. I saw Herschel Gordon Lewis in 2016 in Philadelphia with my brother and sister-in-law. This was at a special screening of original prints of five of Lewis’ horror films, and happened about a month out from Gordon’s death at 90. This was also just about a year away from my brother’s death, who was considerably younger than Gordon at the time he passed. Anyhow, fun fact about movie prints is they are notoriously unstable and touchy, and the colors in them fade quick. And in 50-year-old prints, the effect can be even more stark. In this case, every color was basically washed out to a pinkish-tan so that even the blood was not, in fact, blood red. When we met him, Lewis was skinny and frail, as 90-year-old men tend to be, and he was one of the few people in life I’ve encountered who genuinely looked close to death. But his mind was still sharp, his voice was lively, and he was charming in all the usual ways. Still, meeting him was like watching a wind-up doll at work. When it’s wound up, it goes. When the spring runs down, there’s nothing. While Harold Snepsts was the least-famous of them all, he is the secret MVP of my encounters with fame. I met him in the early-90s, when he was just a year into retirement, having taken a job coaching the Peoria Rivermen in the old IHL. That night the team was in town to play our local IHL team and after the game the Rivermen came by bus to the 24-hour grocery store where I worked, presumably to pick up alcohol and snacks for the long bus ride back to Illinois. Because he was so low-level famous, especially in that part of the world, he was more surprised to be recognized than I was to recognize him. He could not have been more gracious. To this day his autograph hangs in my office. It might have no value on it’s own, but to me it’s priceless. Harold Snespts’ autograph is not the only one I display. I have one from John Updike I bought on ebay some years ago, when I finally discovered his writing. By then Updike was already dead and I suppose the purchase was to have something directly connected to him before it was all gone. After all, one thing all dead people have in common is they aren’t making any more stuff, autographs in particular. And this one was unique because Updike actually signed one side of the card, then crossed it out and signed the other. My most cherished autograph, though, is one I don’t actually display – I rarely even look at it at all, and it’s easily been years since I laid eyes on it. That is a signed copy of Stephen King’s The Stand. I was a kid when he signed it, as a Christmas gift from a grandma. She’d written King’s people asking if he’d sign something for me and they sent back some little card that was sort of like a coupon that I could return with whatever I wanted signed. As long as it all went with a prepaid return mailer, he’d sign it. It wasn’t hard to decide on a hardcover copy of the extended edition of The Stand. While the Stephen King autograph might be the most important to me – he’s basically the reason I wanted to be a writer in the first place – I’m glad I did not get that one in person. Being 14 years-old when I got that autograph, I don’t think I would really have appreciated meeting him, if I had met him. At the same time, meeting his as an adult terrifies me. After all, it surely would be a letdown, largely because I’m self-aware enough to know that he and I are not friends and never will be, and his interest in me is as surface-level and transitory as mine is deep and knowing. And because of this, there is no chance we’d ever have a real conversation, or talk, free of the strange imbalance between us. At all times I’d be hyper-aware of who I was talking to and would never see him as a human being. And I could never be less-than completely disappointing and cliché. So while I’m dying to meet him, I hope I never do. I’ll be honest, I’m not sure I have an overarching point here beyond some random ruminations on the strangeness of fame and the desire on the part of humanity in collecting a person’s name. Written on paper. By that person. In other words, the autograph. Each of the meetings I talked about before with the famous people all resulted in an autograph. No, I did not get Allen Ginsberg’s on those stairs in the bookstore, and if he had signed something only for me at that moment, there probably would have been chaos. Rather, it was later after the reading, when some lackey took a pile of books backstage after the event ended – mine included – that I procured it. Sure, it required a middle-man to get it for me, but when the lackey returned with the pile of books some time later, everything was signed. Including mine. So why do we collect signatures? Why do we feel the need? Is it because we want some signifier that some other person touched this thing and that by having it myself we have a connection? That for just a moment we were in the presence of one another, sharing the same air, and he may even have breathed in air I breathed out, and vice-versa? So this ephemera is to serve as proof of some sort of random, fleeting connection. Or is it we want validation? That because this person took a moment to do something inherently silly for us, that somehow my worth as a human is confirmed? Or is it simply that, even though I’m going to return to my regular life of just being a nobody, that there was at least a moment where he and I were equals and that because I was equals with that famous person, if only for a moment, that I am somehow famous, too. And that for at least that moment, I mattered as much as they did? There’s some dispute on the age. Wikipedia tells us he was 90, while other sources disagree.